So no points this year. Students get a ‘P’ or an ‘N’ for each project. ‘P’ means the student did a proficient job at what they were asked to do. An ‘N’ means the work needs more attention. So far students have a lot of ‘N’s. And they keep redoing things, and the work keeps getting better. Eventually the project gets the ‘P’. And no one is complaining, it is amazing. The students share work with me, I give feedback, they consider the feedback and make a decision as to what to do about it, and keep going. We are only a month into the year and everyone is at a different level, doing different work. Every student has an individual learning goal for each day. And best of all, as I walk around the room I see more actual engagement than I have ever seen. I know it is only a month into the year, but I am really liking what I see so far. I was working on an assignment today for the school culture class I am taking as part of the Admin Credential program at Teachers College of San Joaquin. I was supposed to be writing a vision statement. Researching that brought me to the web site of Minarets High School in O’neals, California. Minarets is one of those schools that appears to be doing it right. I see them doing amazing things in amazing ways. I thought I would find their vision statement and “borrow” it. You know, use it for inspiration. I was disappointed. I couldn’t find their vision statement. I did find this though. A grading policy that really got me thinking about my own grading policy. I really struggle with my grading policy. I change it every year. I want to to measure and reflect what my students are able to do, not how well they sit in their chairs for an hour, or find the right answers in the text book. I also want them to be able to see where they are at, grade wise, all the time. I hope to someday have this figured out, but I know I am not there yet. My students need this lesson. 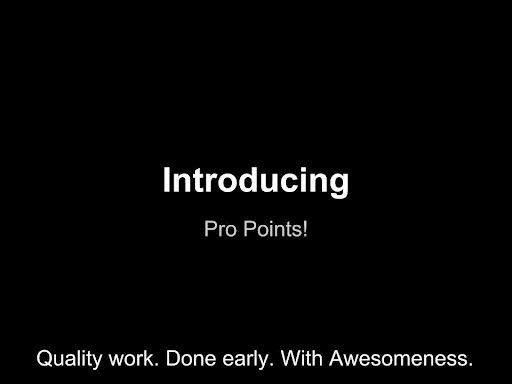 So I decided I need to adopt “Pro Points.” My new Pro Points policy is here. I will be springing this on the students on Monday. Now I need to get back to that vision statement I was doing.